When: 1st Sunday of every month October to April, with additional markets on Easter Sunday and for cruise ship visits. See the table below for market dates. Market Day Ferry Fares: Return ferry fares from just $43 per adult, ex Cape Jervis. Conditions apply. Join a selection of Kangaroo Island food producers at the Penneshaw Markets where the KI Farmer’s Market and KI Community Market combine to offer regional food direct from the producer, together with artisan crafts, arts and bric-a-brac. Meet the very people who grow, farm or make Kangaroo Island award winning regional foods - taste the olive oils, wines, honey and learn why and how it is produced. Island chefs offer ready to eat Island produce and home baked snacks and biscuits. Tastings, breakfast, coffee and a great village atmosphere are all on offer. Stay for the day and enjoy lunch at one of Penneshaw’s cafes or the Penneshaw Hotel. Laze on the beach, meander along one of the nearby walking trails around Penneshaw, fish off the jetty or beach, take a thrilling ocean safari ride with KI Ocean Safari or explore the Dudley Peninsula with KI Wildlife Safari. The Penneshaw Markets are only a few minutes' walk from the ferry terminal and SeaLink offer special same day return Market Day ferry fares. 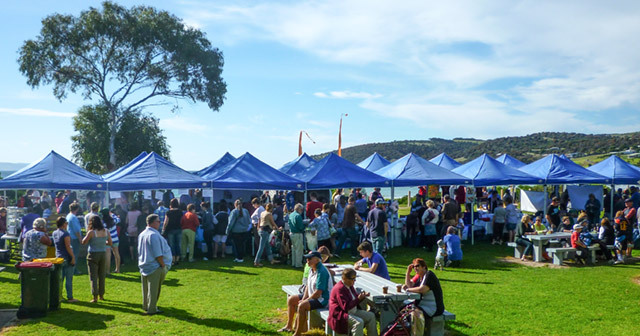 Note: Whilst SeaLink supports the market day with special ferry fares, we cannot take any responsibility for the number of stalls present on the day. ^Cruise Ship Visit Dates. Please note cruise ship visits are dependent on weather and may be cancelled at a time close to the event. SeaLink cannot take any responsibility for a ship's visit or the markets being cancelled. Why not make a day of it with one of our Kangaroo Island Community Market tours? Come along and enjoy the Penneshaw Markets and then jump on board the bus for the Dudley Peninsula Scenic and Wine Safari. Enjoy a 3.5 hour tour around the wineries and local landscapes of the magnificent Dudley Peninsula. Browse the Penneshaw Markets and see coastal wildlife. Take your time wandering the market, chatting, tasting or buying, and then take a 75 minute Coastal Safari or 2 hour Dolphins, Seals and Snorkelling Safari. See Bottle Nose and Common Dolphins, Long-nosed Fur Seals and Australian sea lions and other inhabitants of the coast that surrounds Kangaroo Island. Terms and Conditions Apply. Above fares are valid for travel 1st April 2019 to 31st March 2020, for other dates, please enquire. Must travel on days listed above (market dates) to obtain Special Market Day fares. Travel is available leaving Cape Jervis from 10.00 AM (excludes 9.00 AM ferry) and returning from Penneshaw on or before the 5.30 PM ferry departure. If the return journey is not completed on or before the 5.30 PM ferry departure, full fares will be charged for the full journey. Passengers can take a car and pay full fare for the car providing it is the same day return travel and in accordance with the same day return travel passenger fares. No other discounts are applicable or available. No refunds are applicable if booking is cancelled prior to travel. Bookings can be pre-booked or booked on the day of travel. Payments are as per SeaLink payment conditions. Call 13 13 01 to book.